T cells play a vital role in the immune system by attacking pathogens and cancer cells. The team’s study, recently published in the journal Structure, shows how T cell receptors can be engineered for specificity and function, and provides new methods for creating T cell receptors that are able to target specific cancer antigens, protein fragments that mark a cell as cancerous. The work of Baker’s team is directed toward taking immunotherapy beyond the treatment Carter received. T cells that have been genetically altered to express engineered T cell receptors have been explored in clinical trials. Baker and his collaborators show how these receptors can be further engineered in order to recognize specific antigens on the surfaces of cancerous cells, thereby allowing cancer to be targeted with a heightened, more directed immune response with laser-like accuracy. “Our study demonstrates new routes for custom designing functional T cell receptors with optimal antigen recognition properties. 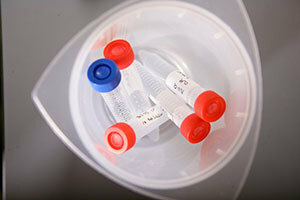 This will help open the door for customized specificity in order to optimize T cell targeting and killing,” said Baker. Co-authors include Nishant Singh at Notre Dame and Dan Harris, Erik Procko and David Kranz at the University of Illinois Urbana–Champaign. The paper is published in the journal Structure and can be found online here: http://www.cell.com/structure/fulltext/S0969-2126(16)30072-7. Originally published by Tammi Freehling at news.nd.edu on June 15, 2016.